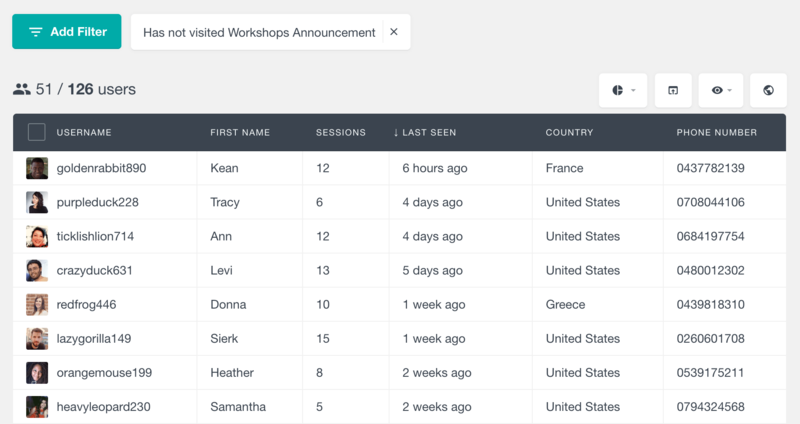 The Page Visit Tracking module of Users Insights can help you find which pages your WordPress users visit while logged in. The module allows you to specify which post types to track, as well as the user roles for which this feature to be enabled. Once enabled, Users Insights will record the visit every time the user opens one of the tracked pages/posts. With this data available, you can then search and filter your users based on the pages visited. You can also view the list of visits for each user in their profile, as well as find the most visited pages. 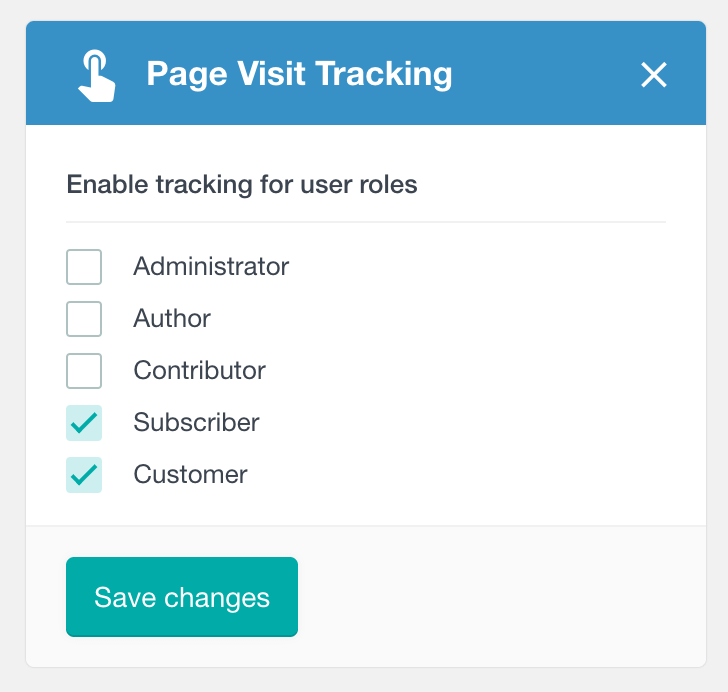 The visit tracking feature can be activated from the Module Options page. 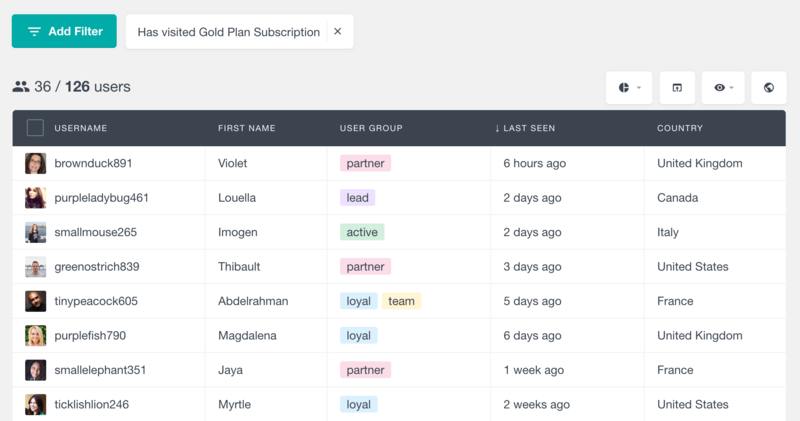 Once activated, you can first select the roles of the users, whose visits you’d like to record. By using this option, you can only record the visits for the users that you need to, instead of all of the existing WordPress users. 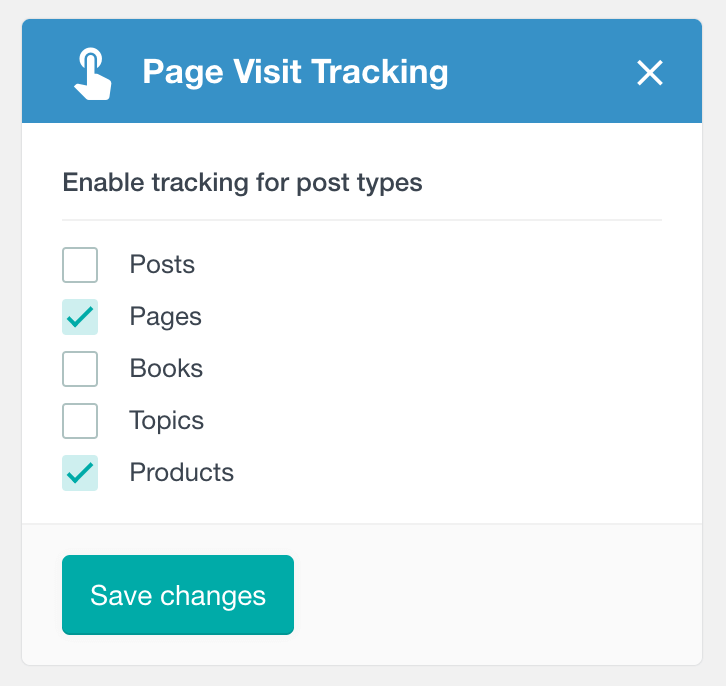 The next option allows you to specify the post types that you would like to track visits for. You can choose from all of the public post types that are registered on your WordPress installation. This includes both the default WordPress post types, such as Posts and Pages, as well as any 3rd party plugin post types. Please keep in mind that the Users Insights will start tracking the visits from the moment when you activate the feature. This means that past visit data will not be available. Additionally, the users need to be logged in in order for a visit to be recorded. Also, Users Insights does not record the full URL of the page visited (with the parameters passed), but just the ID of the page. Another thing to keep in mind is that Users Insights by default stores the last 300 visits, which means that for the users who have more than 300 visit records, the oldest records will be removed. You can configure this number by using the usin_events_max_items_to_store filter, but we generally recommend keeping the limit up to 500. 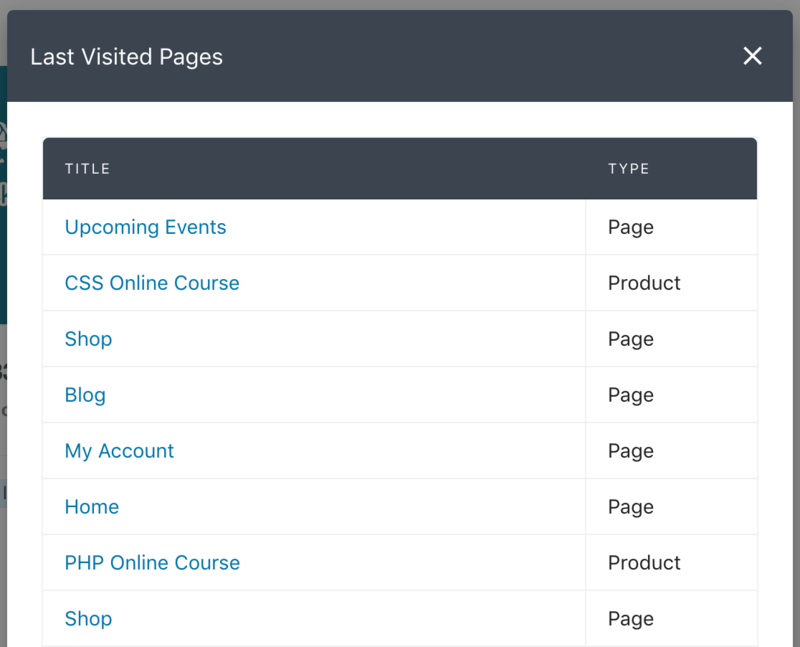 Once page visit tracking is enabled, you can use the Users Insights “Has visited” and “Has not visited” filters to filter your user list based on their visits. As its name suggests, this filter allows you to find all the users who have visited a selected page or post. The filter provides a searchable list of all the existing posts and pages, for which tracking is enabled. Once you apply the filter, you can see all the users who have opened the specified page. This filter works similarly to the above-mentioned filter, but it shows all the users who have not visited a selected page. There can be many scenarios when this filter can be helpful. For example, if you are running a campaign, you may want to find which users haven’t seen the campaign page yet and perhaps send them a friendly reminder. The following screenshots illustrates an example of using this filter. In addition to the above-mentioned filters, you can also explore the visit tracking data for each user in the user profile section of Users Insights. 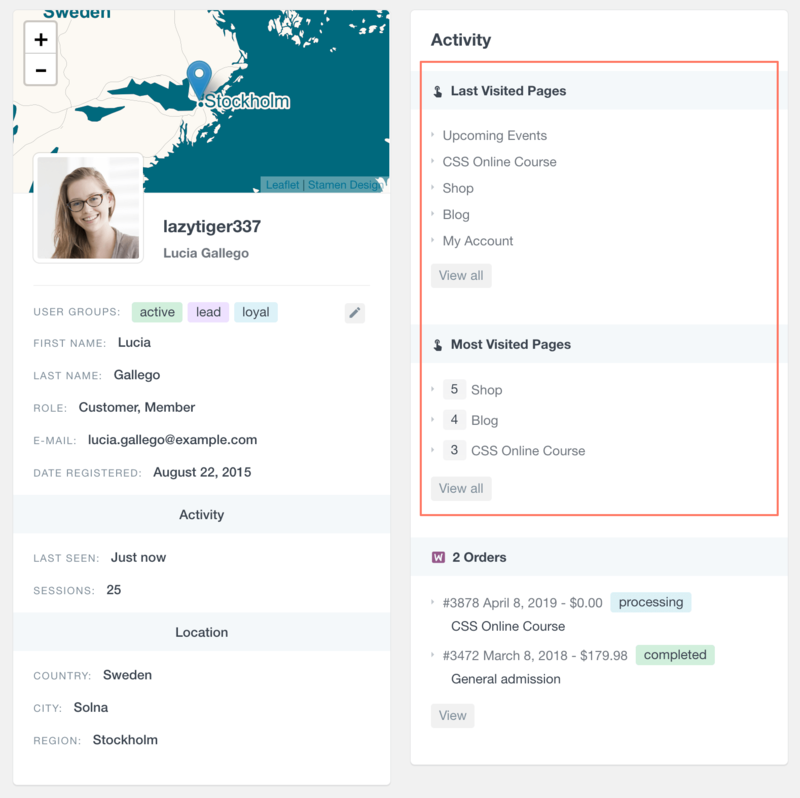 This can help you understand the individual user activity, as well as help you find patterns of the pages that you users view in the WordPress activity log. The “Last Visited Pages” section lists the five most recently visited pages/posts by the user. Clicking on the View All button reveals all of the recorded visits in a modal dialog. This list additionally includes the post type of each visited post. The page list is sorted by the visit order, starting with the most recently visited pages. The “Most Visited Pages” section lists the pages that the user has most frequently visited. If the user has opened a page three or more times, the page will be considered as “most visited”. The number in front of the page title is a page view count and specifies the number of visits. The list includes the 5 most visited pages and clicking on the “View all” button reveals the rest of them in a modal dialog. This time, the list will be ordered by the number of visits, showing the most frequently viewed pages first. Users Insights allows you to combine any of the available filters in the way you like. This includes filters from the supported 3rd party plugins and any of the default features filters. This means that you can use the visit tracking filters, along with many other filters to further analyze your WordPress user activity. For example, if you are using WooCommerce, you can easily find the users who have opened a selected product but haven’t ordered it yet. To bring it further, you can even add a location based filter, so you can create more custom segmentations of your visit tracking analysis. If you need to export the filtered results, you can easily do so by using the export feature. This feature allows you to export the user data in its current state, by applying the current filters and exporting the currently visible columns. Following the example above, you can easily export the users who have visited a product, but haven’t ordered it yet. You can then import the user list to your favourite email campaign service and perhaps send them a coupon to encourage a future order of the product.